Two matches of the 2018/19, two new shapes for Mauricio Pochettino. Pochettino was initially wedded to his 4-2-3-1 as Spurs manager, briefly becoming a 3-4-3 convert before going back to his previous shape once Toby Alderweireld’s transfer ambitions became clear. He has dabbled with a three-man midfield in both a 3-5-2 and 4-3-3, but has never stuck with either for any length of time and it seems to have largely been due to circumstance. That circumstance has partly been a lack of available central midfielders, and that has been the case this season so far. 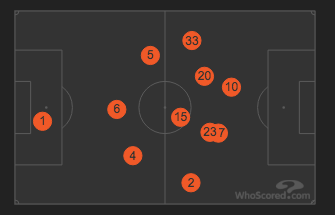 Thanks to WhoScored.com we can neatly see the average position of Spurs’ players in both matches. Against Newcastle, Dele played nominally on the left of the midfield three, with Moussa Sissoko on the right and Eric Dier as the pivot. But Dele was given the job of ghosting forward and interchanging with the unusually-advanced Christian Eriksen, whilst Sissoko was responsible more for protecting Serge Aurier on the right. 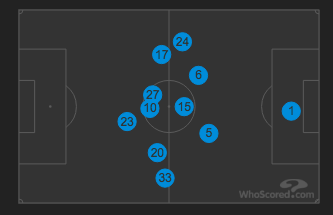 Against Fulham, Pochettino ‘rotated’, as he hinted he might. He took out Aurier and Sissoko – Spurs’ least effective players against Newcastle – and brought in Toby Alderweireld and Kieran Trippier. Notably, the tactics changed wildly with the change in personnel. Suddenly we had a player at the back with a terrific range of passing, and a wing-back known for his crossing ability. Spurs often used Alderweireld’s passing to get the ball wide early, and used Trippier to stand in advanced areas and send crosses into the box. To emphasise this point, only five outfield players in the Premier League (David Luiz, Conor Coady, Jonjo Shelvey, Ruben Neves, Ben Mee) have played more accurate long-balls than Alderweireld this season, and all five have played in both of their team’s opening matches. Only three players have made more crosses than Trippier (14) in the Premier League this season – Johann Berg Gudmundsson (21), Trent Alexander-Arnold (19), Benjamin Mendy (16) – and all three have played in both of their team’s opening matches. The volume of both was significant. As an aside, I would add that none of Spurs’ three goals came from Trippier crosses, and indeed the opener came on one of the rare occasions that Trippier opted *not* to cross and instead played a clever, chipped pass into the corner of the box for Eriksen who was able to make a cut-back. That said, we did score from a wonderful Aurier cross against Newcastle. Personally I am of the belief that crossing is an inefficient route to goal and would rather we dropped our cross volume by at least 50%, but thats a blog for another day. Spurs’ two three-man midfields have probably come from necessity. Aside from Dier, none of our first choice central midfielders are fully fit, with Victor Wanyama just resuming training, Harry Winks building up fitness after a lengthy lay-off, and key man Mousa Dembele not quite ready post-World Cup. But in both matches, as Nathan A Clark points out in his latest article for RealSport, Spurs have been reliant on Dembele’s 20-odd minute cameos to reassert dominance after briefly wavering. 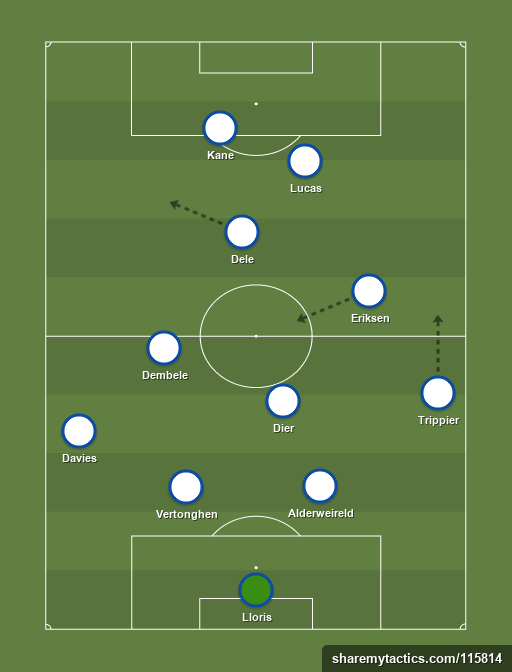 Pochettino has yet to find the perfect balance without Dembele, and that was particularly evident in the second half against Fulham, where the press of their physically dominant midfield became a problem, and Dembele became an essential change. This will lead to an interesting selection dilemma against Manchester United, which I will return to shortly. But in Nathan’s article he also makes the point that Spurs’ midfields have both been borrowed from World Cup teams – the Newcastle shape from Didier Deschamps’ France, and the Fulham shape from Gareth Southgate’s England. With the latter, we can take this a step further as there are many similarities and it is useful to highlight them. There are some obvious differences: England would kill for a player like Eriksen, and Ashley Young is more cross-heavy than Ben Davies, but there are plenty of similarities, and this is something to keep an eye on as the season progresses. Lucas Moura played ‘the Raheem Sterling role’ remarkably well against Fulham, pressing with an intensity that will have caught Pochettino’s eye, but also being willing to vary his play, one moment running in behind and stretching play, the next dropping short and using his quick feet to get himself out of tight spaces. Jan Vertonghen is a close match for Harry Maguire in terms of carrying the ball from the back, and though Davinson Sanchez is not as good as John Stones in possession, they both tidy up effectively in different ways. The approach to the Manchester United match may see a further change in shape. United have approached both of their matches with Andreas Pereira as their deepest-lying midfielder, Fred to his right and Paul Pogba to his left. Fred in particular has disappointed and I suspect that if either Nemanja Matic or Ander Herrera are fit and able to play one or both will come in (Herrera was on the bench against Brighton). A midfield of Pogba, Matic and Herrera will concern Pochettino, and I think he will want to start a more naturally defensive-minded player alongside Dier to counter it. Dembele seems the most ready, but he has history with Pogba. Though Dembele had the better of Pogba in the league at Wembley last year, I have rarely seen any other midfielder have as much success as Pogba has in physically and mentally dominating him, particularly obvious in the league game at Old Trafford and the FA Cup Semi-Final. My suspicion is that Dembele will come in with ‘revenge for the cup semi’ as motivation, as Spurs will fear being over-loaded in midfield. That creates a selection dilemma, with Pochettino probably needing to choose between Sanchez/Alderweireld and Lucas for who to rotate out. I would lean towards leaving out Sanchez, as the prospect of a fresh and confident Lucas running at United’s vulnerable centre-back pairing is one which excites. I think a diamond-ish midfield could be a nice compromise, but it would put pressure on Davies and Trippier to cover the flanks, which is a concern, neither being particularly naturally athletic or possessing ball-carrying ability. Eriksen has had a quiet start to the season, looking far looser than usual in possession, but he will be a key man at Old Trafford if we are to play this shape, as he will be required to protect Trippier against the threat of United’s winger (be that Martial, Sanchez or AN Other) as well as be our chief playmaker. Having Lucas up with Kane may relieve some of that pressure, as it gives us an out-ball and an option in the channels. Jose Mourinho has often had the upper hand on Pochettino, but early season form suggests that Spurs stand a good chance of some sort of result despite history pointing towards a home win. Though it would be just our luck if Mourinho stumbled into a balanced midfield after the Brighton disaster. No wait, that’s that other bloke. As Mauricio Pochettino delivered a staggeringly philosophical press conference yesterday, which moved between the ever-so-slightly sanctimonious and pure, glorious serenity, some of the cracks of the transfer window were smoothed over. He’s wonderful in these situations; a true company man, protecting his team, his boss and himself with pragmatism, the odd joke, plenty of smiles and a warmth rarely seen in such arenas. Spurs only have themselves to blame for this mess — if, indeed, it is one; I’ll come back to that — which began two years ago when we signed Vincent Janssen, Georges-Kévin N’Koudou and Moussa Sissoko, three players we’ve presumably been looking to shift in every window since. We have a squad bloated with problems — some players are not good enough, some want to leave — and Pochettino’s ‘We didn’t sell players and with 25 players in the squad it is difficult to add players.’ comment pretty much explains that it is difficult to do ‘in’ business without first doing ‘out’ business. The plan over the next few weeks needs to be to find loan takers for some of those players that we ultimately want to flog and those players that are ultimately going to potentially cause unrest. Which is, I presume, why we’re talking to Schalke about a loan move for Danny Rose. Within the bloat, however, is a core of excellence. Our first fourteen or fifteen players are a match for nearly any other side in the league, and comfortably top four worthy. The rest? Well, we have to make it work. Pochettino’s brilliance comes in his ability to improve. To squeeze extra from a starting point which doesn’t seem to have any slack. Every year we see growth from within the squad; last year it was Kieran Trippier and Ben Davies, this year someone else will step up, that’s simply inevitable with a coach as good as ours. Edwards has had well-documented problems — before and during his loan spell at Norwich, but all need not be lost and a clean slate and change of approach from both club and player could finally see both benefit. Perhaps I’m deluded and both will be on loan by September. But I do think this window has been a mess. I think Daniel Levy has failed in this window, as he did in August 2016, as he did in January 2017, as he largely did in August 2017 and as he did in January 2018. But the failing, in my opinion, is in not putting an appropriate structure in place as much as being one of (lack of) ambition or his famed negotiation tactics. He invites pressure onto himself by being so closely involved in the process, and by not having recruitment experts on hand to do what he cannot. We accept that Spurs cannot match the spending power of other Premier League clubs with bottomless pits of cash — certainly not having just spent a billion quid on a stadium, and certainly not until we are at a point where we can stretch our wage structure (after a year of increased match-day revenue, perhaps). So we need to be canny, we need to dig that bit deeper, we need to use other methods to identify players. It all seemed to be going so well with the (albeit short-lived) appointment of Paul Mitchell, his black box, a new analytics team, and an increased focus on using ‘modern’ methods to recruit, rather than relying on word of mouth and ‘the eye test’. This has not yielded results. As I’ve spoken about on The Extra Inch, my biggest hope for this window was that Spurs had got their act together and would act early to secure targets which may be a little under the radar, making the deals that bit easier to do. Pochettino’s pre-World Cup comments implied that the intention was to do business early, to have signings available for pre-season. Clearly, our inability to sell has inhibited our ability to buy, and we have to consider that in future windows. Perhaps we need to accept less. Or better, to not buy trash in the first place. I hope that this will lead to a change in approach. Where a signing is simply squad fodder, let’s promote from within instead. Let’s utilise the talent already at the club to fill those squad places. This has multiple benefits, but the main two being the savings in outlay (of course), which frees up funds to genuinely improve the first team, but also creates the sense of a progression route being in place from the Academy, which will hopefully put an end to us shedding our top talent in the way that we have over the past two years. It is clear to any sensible observers that Spurs have basically stood still this summer whilst, at least on the surface, those around us have improved. The window has been a disaster in many ways, but the disaster is within context and — just as importantly — is containable. Even having signed nobody, we probably have the fourth best squad in the league, and we probably have the second best manager in the league. A manager capable of over-achieving, and so third place again would be no great surprise to anybody. We are short on fit first teamers for now, sure, but we have a relatively ‘easy’ (with the caveat that ‘there are no easy games in the Premier League) start to the season that will hopefully allow us time to get players fit before we play United. The positivity that the new stadium will bring can provide the same bounce as a new signing and whilst we might be left wondering what might have been had we strengthened, I still foresee a positive season for Spurs, and hopefully this will be the year that we finally bring a trophy home. On a personal level, I have negotiated flexible working for the next few months which will give me a little more time to write, to podcast, and to engage more generally, and I can’t wait for the season to get going.